Yeah, there it is. I just said the cheesiest thing when it comes to talking about games. “The best game I’ve ever played.” or “The greatest game in the world.” I can’t help it. I seriously cannot stop myself. Here after the end of it all, I can’t think of another game, and then think of Undertale, and say “This other game was definitely better than Undertale.” Even my all-time favorite game, The Legend of Zelda: Twilight Princess, doesn’t hold a candle to this game. It’s better than those other games that I’ve already talked about on this site. And that’s my opinion. It’s really up to you and the game itself. And to decide that, you’ll have to play it on your own. Ok, ok, ok. I’m sincerely sorry. I have to start talking about it now. On the surface this game is vehemently similar to an old game called Mother. 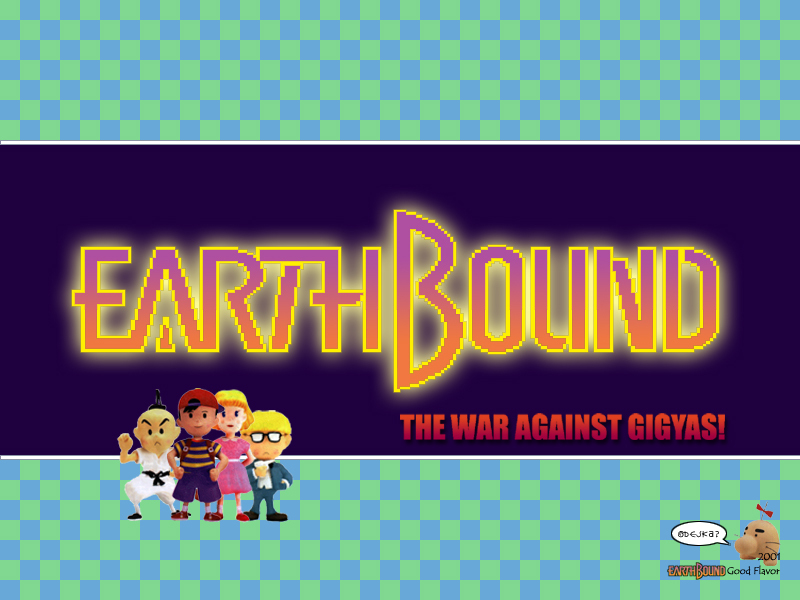 Or, as most people from the West know it, Earthbound. Yeah, that little kid from Super Smash Bros. 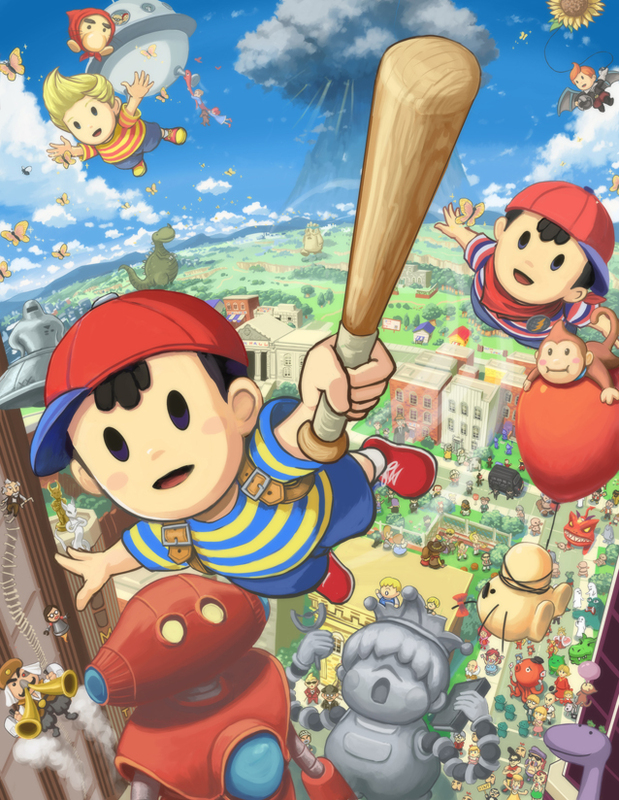 The one named Ness? He’s from that game. 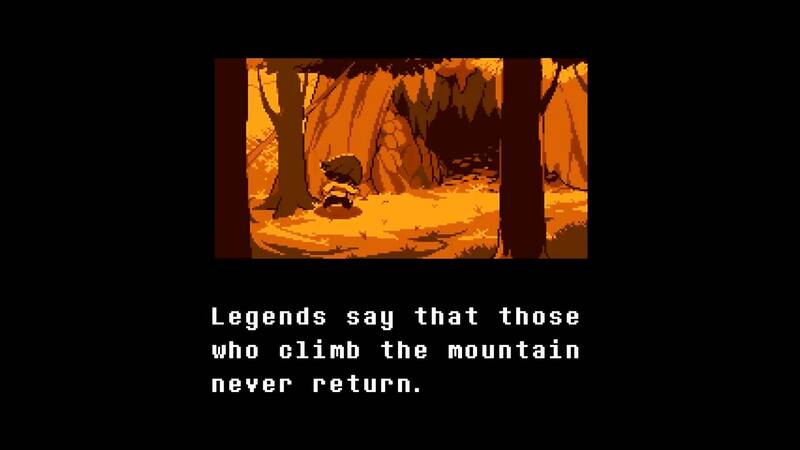 The easiest way to describe that game is an old-style top-down JRPG. 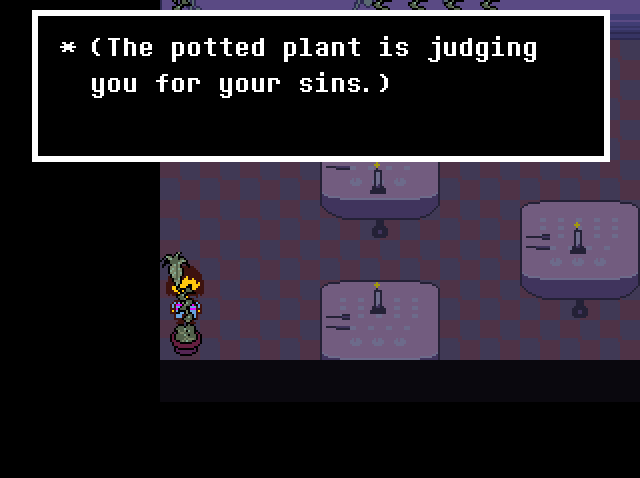 The hardest way to describe that game and indeed Undertale too, is it’s an old-school top-down JRPG with the most charmingly weird sense of humor, a deep and disturbingly dark backstory, and–honest-to-God–the most memorable characters that can exist in such a medium. Undertale is a homage like no other work I’ve seen before, but it goes above and beyond, surpassing even the thing it’s based on. Because, unlike in Earthbound–or any other RPG, for that matter–in Undertale, the game can be finished without killing a single thing. Unless you want to bring up the example of that druid from World of Warcraft, who got to max level by doing nothing but picking flowers (it’s probably one of Kyle’s alts), this is the only game of its kind in so the far that you can resolve every single encounter in the game without having to take someone’s life. It’s a game I’ve wished existed for so long but never did. It’s the old “the pen is mightier than the sword” line, but cranked up to maximum overdrive. Now, that’s not saying that you can’t kill someone. You can. You absolutely can. Take a weapon, violently attack someone, and KILL them, DESTROY them, MURDER them in cold blood. You have that choice at every single moment in the game. 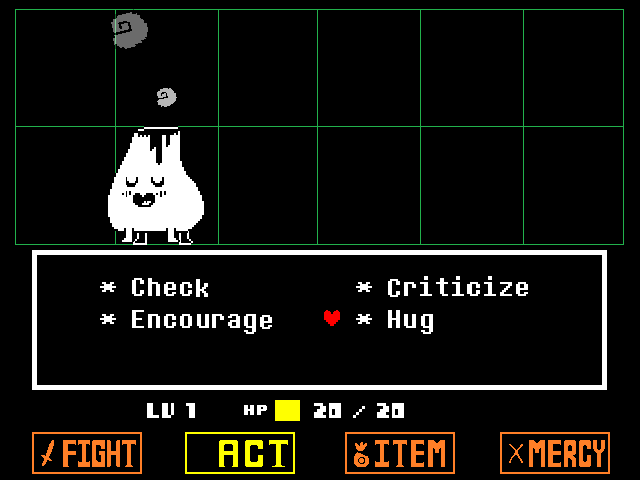 Undertale isn’t like a lot, and I mean a LOT of games, where choices “sort of” matter. In this game, there are a lot of choices. And they all, ALL have impacts on the rest of the game. Pick up an item, the game remembers. Drop an item, the game remembers. Talk to an insignificant creature in a crowd of dozens, the game remembers. Kill someone, the game remembers. Go ahead and load an earlier save–scrub, the game still remembers. This is not a game where you can just go back and do over. You have a choice, and you decide with your heart and Soul what you’re going to do. “With your heart” is a good way to describe what you’ll be doing a lot of. 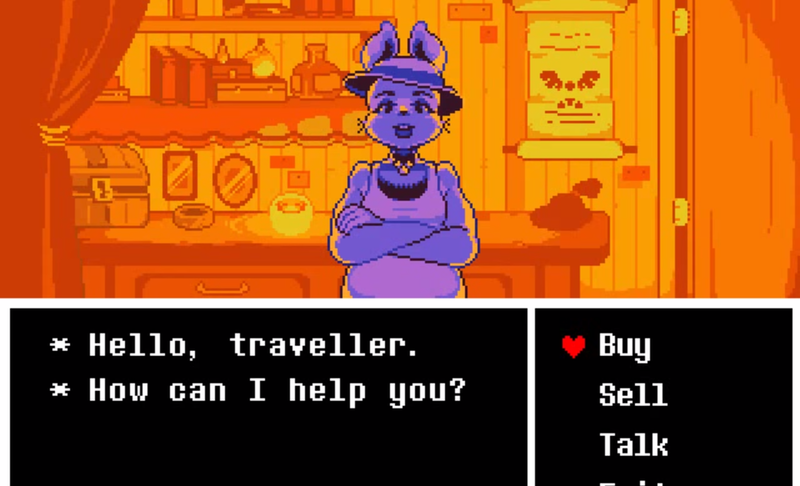 Unlike in nearly all RPGS, during the many encounters in Undertale, you won’t just simply maneuver the menu, select your choice, and wait again for your turn. After you make your choice, the other person does literally whatever the hell they want while you have to attempt to survive their oncoming, err . . . “attacks.” Look, I’m having trouble describing it, so I’m going to show you an image. 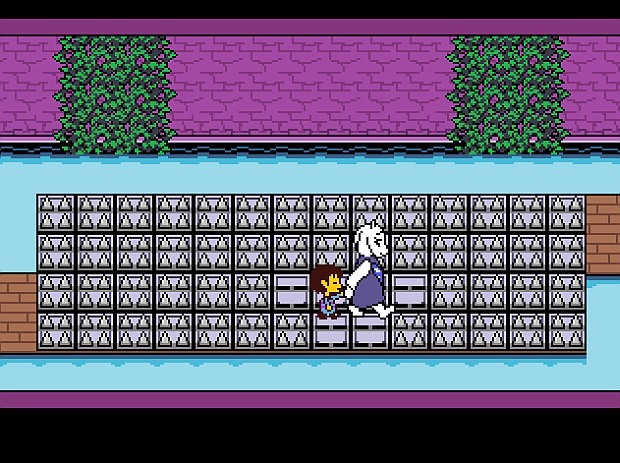 This is the basic layout of an encounter in Undertale. See that white box in the center. That’s the playing field. The red heart? That’s yours, yep. All sorts of stuff happens on this screen. You control the red heart and well, try not to die. Or you take a lot of damage, and eventually die. In Undertale, a lot of what determines how strong you are isn’t necessarily determined by the items you use and the gear you equip. A lot of it is raw skill. You’re really playing a bullet-hell sort of game inside a JRPG inside a choose-your-own adventure novel. It’s crazy how well everything works together in a seamless fashion. I admit, it looks very, VERY simple from a graphical standpoint; it intentionally looks like a twenty-year-old game. But you haven’t seen anything yet. I would show you what I mean, but I can’t. Because that would be spoiling the game. Oh, and the characters! I’ll give you just a sample. 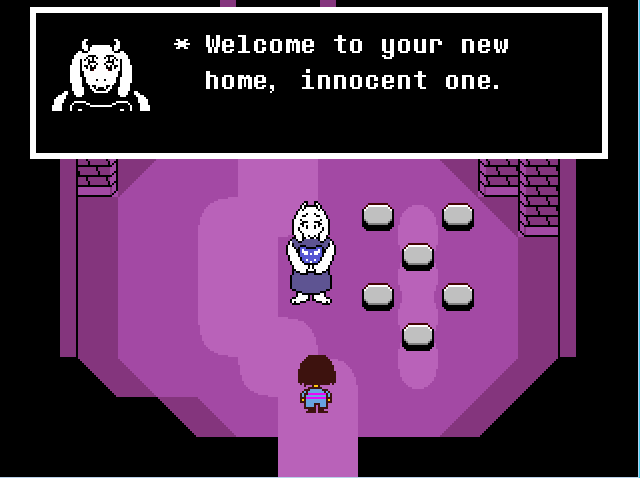 This is Toriel, you meet her almost immediately. Is she important? Maaaaaaaybe. Th-That’s enough, even though there are so many more than that. No character or enemy is a throwaway. There are no trash encounters in this game. I mean, technically maybe but, they don’t feel like it. Every single creature has a life and a way of living it. I’m not even going to mention the relationships and connections between them. And umm . . . this. It isn’t just electronic sound either, oh no, especially the closer you get to the end. The music is made by an absolute genius, someone who really gets mood and atmosphere just right. Even in places that don’t make sense. Like that third sample up there. What the hell was that. Like no, seriously, the music is so damn good I can’t even begin. YouTube’s crappy audio quality doesn’t do this soundtrack justice at all. 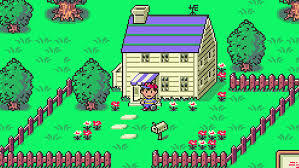 The writing is also very similar to Earthbound, as there are laughs around every corner. But it’s Undertale‘s ability to intersperse this humorous writing with an ridiculously deep story and branching dialogue that impresses me. 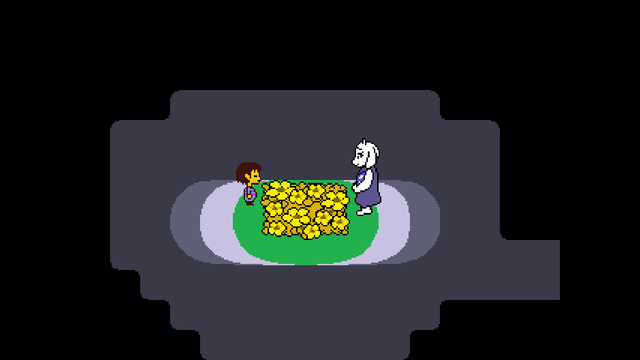 Undertale has, as of right now, at least three different endings, depending on what you do. I’ve only experienced one of them, and nothing in the world will make me perform the actions required to see the other two. In my playthrough, I somehow managed to spare every single person. Apparently, if you’re intent on killing everyone, the game changes it’s entire plot rather quickly, and it’s so very far from pretty. I won’t do that, I can’t, I don’t have the heart. Or rather, I do. Some of the characters in this game are so well-written I swear I’d met people just like them in real life. I’d sooner quit the game before killing any of them. 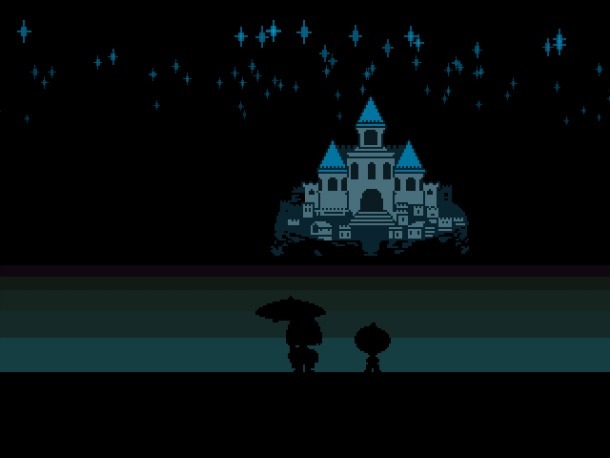 Undertale is especially effective at and very fond of using motifs, both musical and literary. If you don’t pay too much attention you may only notice a few passingly. But if you explore around and notice the smaller touches, things will really start to string together in ways that really won’t come to fruition until the end. What really makes this game so special, though? Why am I going head over heels for this damn game so much? Why do I love this game with my whole heart? This game has them all. Undertale is the only work of art, never mind video game, that has brought out nearly every emotion in the span of time it takes to complete. It’s funny, sad, scary, thoughtful, confusing, anger-inducing, depressing, embarrassing, wonderful, shameful, happy, distrustful, indifferent, and loving. 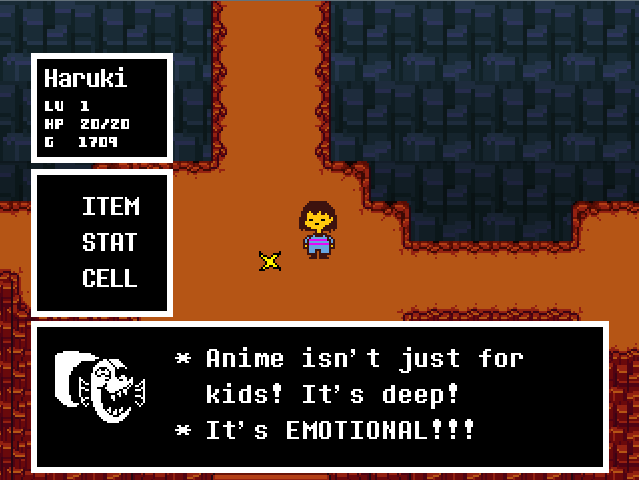 Don’t play Undertale for action, even though there’s plenty to find. 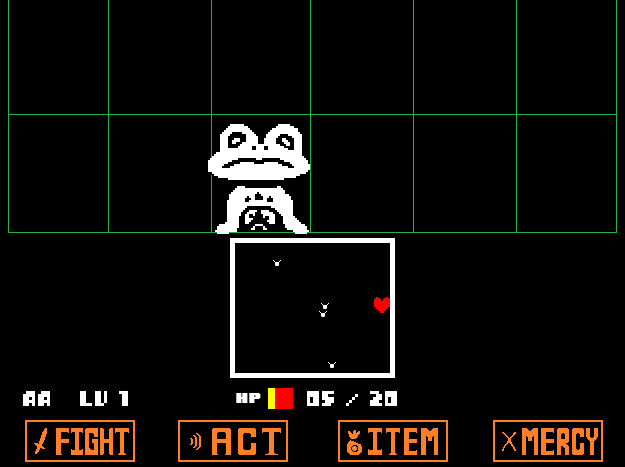 Don’t play Undertale for challenge, even though it can be very difficult. that you haven’t decided for yourself. If this big wall of text and pictures and music isn’t enough, try playing the demo that has been out for years now. 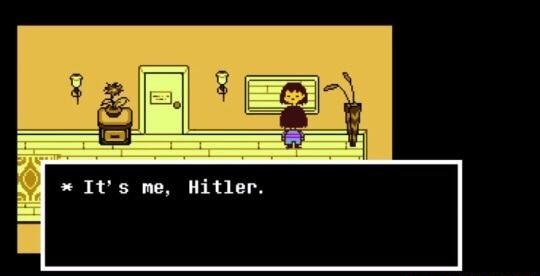 Maybe then, you’ll be filled with enough Determination to make a choice. Previous PostCover Art for “Babylon’s Ashes” (The Expanse #6)Next PostMore Clips From “The Expanse”! Mhm mhm, so you sound quite enamored with this game. I will try it out probably soon, since you were magnanimous enough to gift it to me on Steam. But I hope your love for this game hasn’t blurred your perspective too much: does it have any flaws? like, any at all? 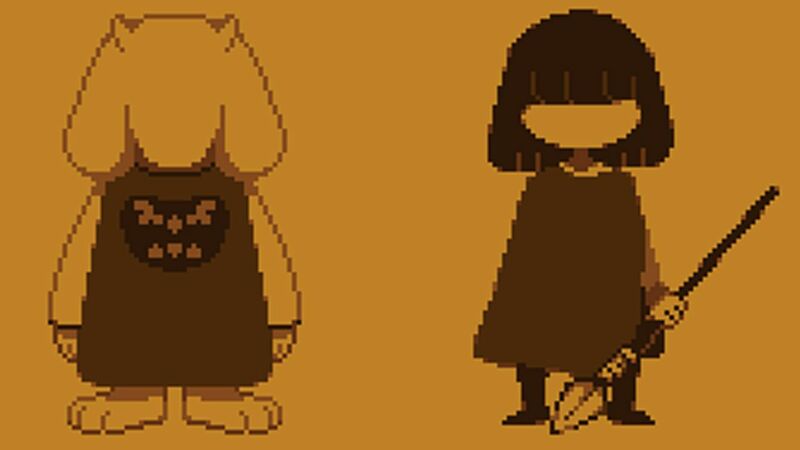 “Undertale” was created, directed, and designed by Toby Fox, with Sans Cheulunel and Temmie Chang as Artists and Writer. I WANT THOSES FIGURES OF THE CHARACTERS!!!! WHERE DID YOU GET THEM!?!?!?! It has plenty of flaws, the combat isn’t great. I started out not killing anything and after a point I just stopped caring because killing it was faster and easier. Also too many “random” encounters (I put that in quotes because Tyler says they aren’t, but they’re definitely just as annoying and boring). The one good thing about the game was that I could pay a spider for a donut and it may or may not have been made out of spiders(?). On another note, I would never do something as boring as levelling by picking herbs. You’re love for this game is evident, especially since you gifted it to all of us, which by the way was how much more money you spent now instead of you know, fulfilling one of life’s basic tenants. Where was I? Oh yes, I may try this game if I ever feel like thinking about puking once every 5 minutes. Jk, or am I?